Hello! Do you have the habit of eating fruits every morning? As for me yes mostly unless I am very busy or there is no more fruits in my fridge. Well for the working urbanites with tight schedule we don’t really have lots of time to prepare breakfast so usually I will have something easy to prepare. As for my daily fruits and vitamins booster I have Zespri SunGold Kiwifruit in the morning. Wake up head to the kitchen and start my day with a sungold kiwifruit. The easiest is to wash and eat it straight. Yes we can eat the skin as well because the skin is loaded with more fiber. Tadah! this juicy, golden-fleshed Zespri SunGold Kiwifruits has a refreshing sweet taste with just a hint of sour with a delicate texture inside a smooth skin. It is better to eat the fruits and vegetables raw! Healthy is Happy! My simple post workout treats is the fresh and juicy Zespri SunGold Kiwifruit. Loads of Goodness and Energizing! Rush hour breakkie! Sungold Kiwifruit juice & butter orange biscuits. Source of energy to kick start my day with hi-fiber and vitamin C! Eat Clean & Go Green, for busy urbanites like me I use to have breakfast on the go. I like overnight oats in a jar with dried cranberries, organic green peas, chia seed & Zespri sungold kiwi with skin to boost my digestive & immune system. It is easy to prepare, carry and eat. 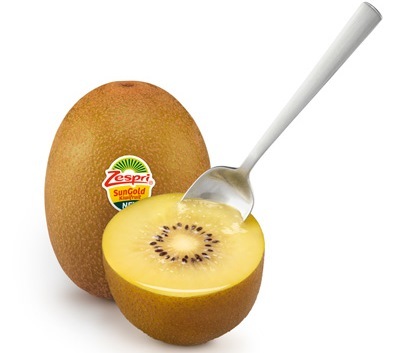 Zespri SunGold Kiwifruit has 10 times the nutrition of apples and 3 times the vitamin C of Oranges. Zespri SunGold is a great source of vitamin C, dietary fibre, folate and other minerals and antioxidants, making it one of the most nutrient-dense fruits available. Vitamin C is essential for our body vitality, immunity and skin beauty. Do you know that one Zespri Kiwifruit a day can provides us our daily vitamins requirement. It contributes to the normal function of the immune system and can assist with the body’s uptake of iron. This power-packed fruit is also beneficial for health conditions such as diabetes, as it has a low glycaemic index (GI) (a measurement carried out on foods and their impact on our blood sugar). It is renowned for its mellow yellow flesh and luscious tropical-sweet flavour makes it the perfect summertime refreshment. Zespri SunGold Kiwifruit has potassium that is essential for cell, tissues and organ functions. ​Eating Zespri Kiwifruit regularly contributes to good digestive health. The fibre and actinidin content in Zespri Green Kiwifruit lies at the heart of Zespri Kiwifruit’s digestive benefits. This combination is responsible for all the beneficial effects on gastric and intestinal function. I've been consuming sungold Kiwi for sometime now..I feel much healthier than before.